Abu Dhabi And Martial Arts? 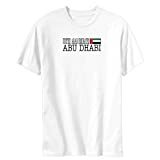 The United Arab Emirates (UAE) consists of 7 states, termed emirates, which are located in the southeast of the Arabian Peninsula in Southwest Asia on the Persian Gulf. The three most well-known emirates are Sharjah, Dubai and Abu Dhabi. Abu Dhabi is the capital and second largest city. It is also the country’s center of political, industrial, and cultural activities. One of the martial arts activities that has been gaining in international reputation is submission fighting. Sheik Tahnoon Bin Zayed Al Nayan, who happens to be one the sons of the former President of the UAE, Sheik Zayed, has been the driving force in introducing martial arts to his home country. While studying in the United States he started to learn more about grappling which led him to training in BJJ (Brazilian Jiu-Jitsu). A man with an open mind and an eagerness to learn, Sheik Tanoon also took up Russian Sambo, freestyle wrestling and Muay Thai in which he became an expert in all. A true mixed martial artist! He sounds like our kind of guy! After getting back to Abu Dhabi he immediately went about in creating a combat center to provide his people with the opportunity to study and learn more about martial arts. It was named the Abu Dhabi Combat Center or short ADCC. The man of vision and action that the Sheik is, he introduced a tournament in which the world’s best and most famous grapplers and submission fighters would compete again each other. This tournament is simply known as the ADCC World Submission Wrestling Tournament. It has become <strong>THE</strong> submission grappling event in the world and is being copied across the globe. To give you an idea of the caliber of competitors who have fought at this tournament are for example Renzo Gracie, Royler Gracie, Mark Kerr, Tito Ortiz, Jean Jacques Machado, Rigan Machado, Rolles Gracie, Fabricio Werdum, Josh Barnett, Vitor Belfort, Ronaldo ‘Jacare’ Souza, Roger Gracie, Dean Lister, Jake Shields and many more. Impressed? I certinly am. Abu Dhabi And Martial Arts! Did you just buy something and are in confusion about how to transport it home? Do you need a truck on rent with some helping hand? A storage facility in Abu Dhabi is the answer to all these issues. Such companies provide all types of solutions with regard to packing, storing and moving problems. Storage facilities in Abu Dhabi offer much beyond your assumption. Keeping in mind the needs of shoppers, Abu Dhabi Storage Company has designed a special service called Muscles and wheels – rent a truck option. Shoppers find this option very convenient for moving all their purchases. It is very difficult to transport big appliances like washing machines, refrigerators, air conditioners etc to your home or hotel. Muscles and wheels – rent a truck option is available to make your transportation comfortable. This facility provides you with man power and truck to transfer all your new purchases at your desired destination. It is burdensome for us to carry delicate or large items but efficient personnel at moving companies are highly trained and know their job perfectly. You don’t have to take any stress or tension for relocating things, all will be done neatly by company professionals. At Storage In Abu Dhabi we provide all the facilities that one looks for packing, storing and moving things. The company is equipped with high level of security measures which guarantees that customer’s belongings are safe. We aim to give highest satisfaction to our customers by offering them the best service. The Box is the ultimate solution for any type of storage issue. Moreover our moving service in Abu Dhabi makes shifting of goods really comfortable. Though it is Dubai that has been in the forefront of the news, the effects of the economic slowdown, involving construction and real estate has been felt all across the Middle East. 2009 was a particularly bad year for Dubai, but other emirates like Abu Dhabi are also reeling from the impact of the global financial crisis. Thankfully, the economic managers in Abu Dhabi have been more astute in adopting various fiscal measures and stimulus packages to combat the negative effects of the economic downturn. Although the effects of the economic crisis were still being felt in the last quarter of 2009, the residential market in Abu Dhabi is showing signs of stabilizing. Rental rates had declined all through the year, albeit at a slower rate each quarter. It was thought that affordable rentals and better quality alternatives in Dubai apartments influenced weaker residential demand levels in Abu Dhabi properties. Elsewhere, substantial portions of planned residential projects were temporarily put on hold with delays at Ream Island and Al Raha Beach. However, the expected completions at the Khalifa A and Al Reef projects will help in easing rents, reducing pressure for both residents and occupiers looking to expand their workforce within Abu Dhabi. Annual rents for apartments posted the strongest performance with a one bedroom apartment down 4 percent compared to 3rd Qtr 2009. In the prevailing situation, landlords and agents are now more open to negotiations with tenants. The sales market also started to show indications of a slight upturn in fortunes, with increases in both inquiries and the number of sales transactions. However transactional volumes are anticipated to rise gradually, with no return to the levels reached during the first six months of 2008. The easing of rents and increasing power of tenants in negotiations are expected to continue in the short term. In the office market, prime rents continue to slide and are down 45 percent from peak prices seen in 2008. A number of key commercial developments are still quoting rates of AED 3,000 per square meter per annum regarding property for sale in Abu Dhabi. Despite the comparatively low rents, getting tenants still poses a challenge for both owners and agents. Increased availability of rental spaces provides end users with greater accommodation options and improved bargaining power with landlords. Commercial demand remains focused towards smaller office units. While vacancy rates for office accommodation during the third quarter of 2009 remained low at around 2 percent, the impact of new upcoming units and weaker demand for office accommodation could see this rate go up during the course of 2010. Meanwhile, amendments to commercial law reducing the levels of capital required have encouraged an increase in start up businesses, which has in turn expanded the numbers of potential commercial tenants. If the government continues to make the emirate’s property laws more consumer friendly, it is expected that this will further increase the demand for commercial space in Abu Dhabi both in the short and long term. Sim Whatley is a veteran opinion leader especially on the issues concerned with people wanting to live and work in Dubai. Considered as one of the most read authors in Middle East the community portal of which he is founder CEO Dubizzle provides solution of every issue from Dubai real estate to considering the right Abu Dhabi properties, choosing the right job in Dubai and meals, to buying cars in Abu Dhabi. The Saadiyat Beach Golf Club was officially launched on 28th January 2010 in with a host of golfing stars and celebraties from the world of sport. The launch was hosted by golfing legend Gary Player, one of the greatest golfers of all time who hit was the first to tee off on the stunning 1st hole. The event was a hotly contested affair, with Northern Ireland’s young prodigy, Rory McIlroy, leading the charge with a combined team score of 27 under par to win the debut Classic. And with a wealth of golf’s future stars playing the lush fairways and sweeping greens at Saadiyat Beach Golf Club, Gary Player was optimistic about the future of the sport. The 18-time Major winner tipped McIlroy as the next possible world number one. “He has a great team behind him, bags of talent and one of the best swings in golf. If he continues the way he is going, I have no doubt Rory has the potential to be the next number one,” said Player. McIlroy, last years European Number 2 and the current world number 11, was full of praise for the Saadiyat Beach Golf Club and its role in helping establish the emirate as a world-class golf destination. McIlroy said “We start our season in Abu Dhabi and have a three week ‘swing’ in the Middle East. The UAE has become a great destination and with facilities like Saadiyat Beach Golf Club, I can only see more and more golfers coming to play here. It’s ideal for practising and the facilities are world-class”. McIlroy finished third in January’s Abu Dhabi Golf Championship. A wealth of up-and-coming talent on display — in the form of Melissa Reid, Maria Verchenova and Henrietta Zuel, the Ladies’ European Tour rising stars, and England’s Oliver Fisher — showed the watching crowds why they were widely-regarded as the future of the sport with an impressive on-course display. And the quartet was full of praise for Abu Dhabi’s newest golfing centre of excellence. “It has been wonderful to come and meet up again with my friends from the Gary Player Group. Mr Player has designed many great courses but this surely has to be one of the most spectacular. I’m looking forward to spending a few more days here in Abu Dhabi,” said Verchenova. Come to Saadiyat Beach Golf Club and book apartments in Abu Dhabi. Paul has travelled extensively for both business and pleasure throughout Europe and more recently the Middle East. Paul runs a website promoting holiday rentals in Abu Dhabi and worldwide. Abu Dhabi has experienced enormous change within the last 60 years. From a small fishermen village with 5000 inhabitants in 1950, the discovery of oil in the 1960¿s transformed it into one of the wealthiest capitals of today¿s time. Whereas half a century ago locals lived in mud-huts and had no hospitals nor schools, they now enjoy modern infrastructure, luxury hotels and one of the highest levels of personal income in the region. At the same time tourism in Abu Dhabi is growing at an incredible pace, with the number of guests in the Emirate almost tripling from currently 0.7 to 3 million in 2015. Logically, the question arises what impact this tourism growth has for the local people of Abu Dhabi. Do they profit from this development? Are they in favor of it? How is their life influenced by tourism? Through living in Abu Dhabi for 5 months, conducting interviews, newspaper scans, literature reviews, and a community survey, it was possible for the author to arrive at many interesting findings, and at the same time create a book which explains all important aspects of social and cultural impacts of tourism in a destination.